Putting a 85 GW Grill on a 88 GW will it work? I've decided that the 85 Grill on the GW looks better than whats on the 88. Question will it fit? Anyone tried that? Re: Putting a 85 GW Grill on a 88 GW will it work? all the grills can be swapped. Here is an 83 or 84 cherokee 2 door grill i put on my 90. Thanks greatly! That Cherokee Grill looks sharp! Since the 88-90 grill surround is getting way to hard to find undented I need other options. 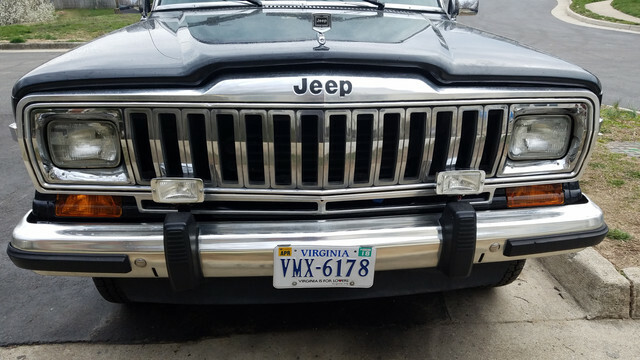 Yea my outline metal grill frame thingy on my 90 is undented and has good chrome.. this cherokee one has a dent an the chrome is a little scratched up.. I did realize the center peice can just be taken out and the outer frame csn be kept on. I might put my original one back on as thr JEEP emblem and Jeep on tje grill could be see as too much.. plus no dent and better chrome.